“Code to produce this figure” Link at the Fig 1. is not Working. However, cube part is amazing. Thank you for your work. Really impessive. Thanks, I corrected the link. If I wanted prisms instead cubes, is possible to do it ? for example i have the coordinates of six prisms (the bottom,left and front node) with six different heights. When I active the tic option on, the coordinate system seems to me a diaster. Do you have any correction for this version that the coordiante system could be just in the middle and every tic works fine without the color flag flot? Moreover, I wish I could define every length of cube I want to draw, if that’s not too much difficult to write it on. If you further want to change the length of every cube you have to add another option to the cube function that can do this. I tried to run both codes “single_cube.gnu” and “cube.gnu” under Gnuplot 4.6 Patch level 3. 0.000000 1.000000 1.000000 3\n0.000000 0.000000 1.000000 3""
Any idea? 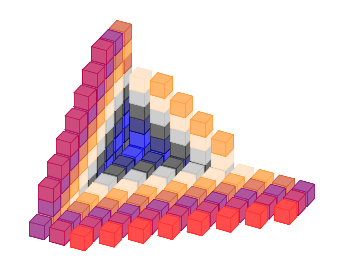 It seems that the function cube.fct is not really understood from Gnuplot. By the way, your idea is great! But of course I would like to understand why I have this error message. That is strange, I have gnuplot 4.6 patchlevel 0 and get no error at all. Even the line showing in your error message seems to be ok to me. Are you running under Linux? no I am running gnuplot under Windows XP Professional! As you say, it is quite strange. Could it be that something under Windows must be done? I never really tested gnuplot under Windows, but it could be that the echo command is not available at all under Windows or not working as expected. You could test it for example by plotting single points as explained here. Impressive looking chart but I’m something of a gnuplot novice and I cannot seem to get this example to work with either gnuplot 4.4.3 or 4.6.5 under ubuntu 12.04 LTS. I first get a diagnostic about a missing argument in the ‘set pm3d’ line, which was easy to get past by adding a digit. at which point my (few) attempts to come up with a workaround have proven insufficient. Did you really used gnuplot 4.6.5? Because the stats command should be part of it. Did you make sure that the cube.gnu and cube.fct file were in the same directory you ran the code? For me the cube.gnu file is still working. That’s correct in newer versions of gnuplot the script for the multiple cubes is no longer working. The stats command complains that no data are in its range. I moved the range definitions after stats and now it is working again. I updated the code in the blog entry as well. German-English typo: “This is not as straight forward as you may thing.” -> think. Do you know, what im doing wrong? Im using Gnuplot 5.0 – is that the Problem? Which version of gnuplot do you exactly use and on what operating system? If I rerun the code under Linux with gnuplot 5.0 it is still working for me, although the result looks slightly different due to a change in how the linetype is handled in 5.0. I´m using Version 5.0 patchlevel 0 on Windows 7 Professional. I read that the plots were done unnder Linux. But is there no possibility to get the results on Windows? 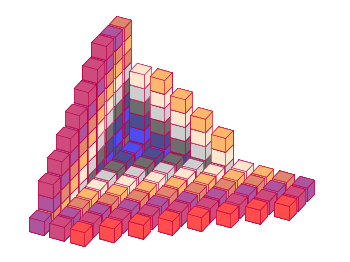 – basically a rectangular surface parallel to the xz plane with height of 1 unit and length of 2 unit. – a square parallel to the zy plane intersecting the first surface at segment (1 0 0) (1 0 1). Then, if you look from the positive xyz direction towards the origin, even though the second surface should cover the first surface, because a point in the first surface is closer to the viewer, the first surface covers the second surface. How should I modify the code to draw only three edges of the cube (only those which can be observed)? I want to decrease the time to plot the graph and to decrease the size of resulting *.eps. I wondered that each of 6 edges coordinates are listed in the “cube” function, so I can delete 3 of them. But I’ve found there are only 4 edges. If this code doesn’t work properly, replace “echo” by “printf”. When I run the cube.gnu plot on GP 5.2 I get a “line 67: out of memory for pm3d_plot->quadrangles” error. This is true for the png and the wxt terminals. Thoughts? I downloaded and tried the example code…. for the multi cube example it draws a blank white display with nothing in it. 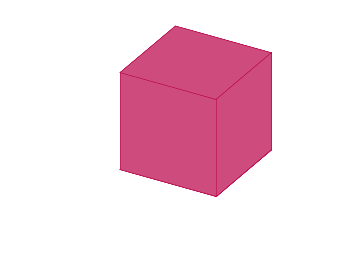 The reddish single cube example works. Warning: Single isoline (scan) is not enough for a pm3d plot. Hint: Missing blank lines in the data file? See ‘help pm3d’ and FAQ. result white gnuplot xterm with nothing in it….. Unfortunately I cant figure out how to fix it. Can you try with the PNG terminal? I think it might be my installation. I will have to install all the missing packages locally. Is there a standard location for the install logs to identify what failed to build.